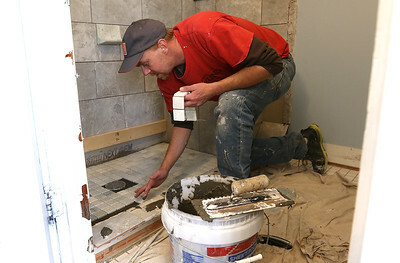 H. Rick Bamman - hbamman@shawmedia.com Shaun Pohlman of Pohlm Brothers Remodeling works installs tile for a bathroom project in a Crystal Lake home on Thursday, April 23, 2015. 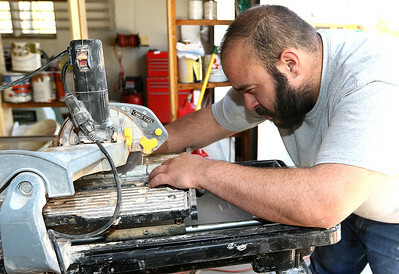 For a bathroom remodel, a homeowner can expect to recoup about 70 percent of the cost upon resale, while a major kitchen remodel could return 67.8 percent of the cost, according to the Remodeling 2015 Cost vs. Value Report, which compares the average cost of 36 types of remodeling projects with the value retained at resale in 102 U.S. markets. 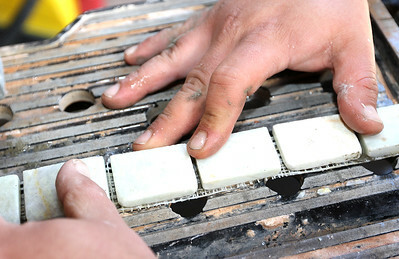 H. Rick Bamman - hbamman@shawmedia.com Jim Harris of Pohlm Brothers Remodeling trims tile for a bathroom project in a Crystal Lake home on Thursday, April 23, 2015. Homeowners today are choosing larger shower spaces with all the trimmings, such as aromatherapy steam showers, round rainwater showerheads, places to sit in the shower and more elaborate shelving. H. Rick Bamman - hbamman@shawmedia.com Jim Harris of Pohlm Brothers Remodeling lines up tile to be trimed for a bathroom project in a Crystal Lake home on Thursday, April 23, 2015.